Everything was prim and proper, even when looking grand. "...Because, with all our faults, we love our Queen." Ah, Victorian Britain. A place of tumultuous social, cultural, and technological change that is unfairly remembered today as the embodiment of Medieval traditionalism with an anti-sexual conservatism that borders on fascism. Victorian Britain is significant for being the birthplace of the modern middle class, for the rapid and jarring transformation to a highly industrialized nation, the massive expansion of The British Empire, some truly fantastic fashions, and, yes, an anxious over-emphasis on morality and propriety... that only barely masked a dark and seedy underbelly of society. Victorian Britain produced some of the finest literature of the English language canon, and also some of the most famous turgid and overwrought prose in history. It was also a time of nostalgia for a period in history that essentially never existed - Arthurian Legend. Frequently, but by no means always, overlaps with Victorian London. Like other eras in British history, it is named for the Sovereign. The Victorian Era overlaps greatly with the period historians call the Industrial Revolution, and this was greatly influential to society and culture of the day. The Industrial Revolution was a period starting the previous century, greatly advancing progress in machinery, especially related to manufacture of goods, and mining of coal - which of course, was self-perpetuating, the greater mining of coal creating further ability to improve and increase use of steam engines. Other advantages, such as easy transportation about the island, and the increasing use of trains, led to the industrial revolution completely changing the economy of Britain, and then eventually continental Europe and the United States. However, this also was responsible for the switch between the "cottage industries" and the factory economies. Instead of jobs being mostly based in at-home businesses, production began to occur more and more in factories, leading to most people moving to cities and working for very little in dangerous and long positions. On the other hand, it was the beginning of class mobility in some ways; the Victorian Era was the first time that there was a real middle class, rather than the feudal division of common and aristocracy. The corporation developed into its modern form, creating a new kind of rich person who was still "common"—the corporate executive—along with the tropes associated therewith. Industrialisation also created the beginnings of modern consumer culture. The aforementioned movement of work from at-home business to factories and (by the end of the Victorian Era) offices turned the household from a unit of production to a unit of consumption—and with the factories turning out all sorts of goodies by 1900, ordinary people were starting to buy them. 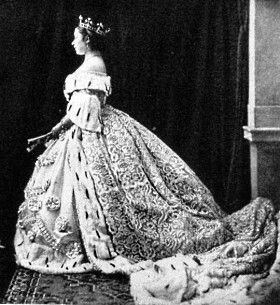 If you know anything about the Victorian Era, you are probably thinking of those tons of dresses and top hats. 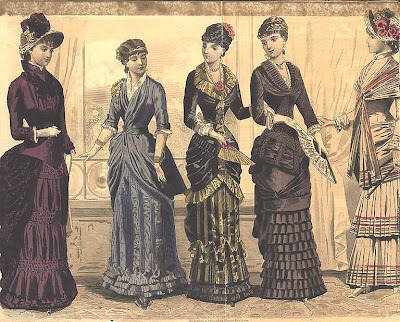 Fashion was constantly changing, from this in the 1840s ◊, to this in the 1880s ◊, as it does these days, and was very important to the new middle class. Where the aristocracy didn't have to worry, and the working class didn't have time to worry, the middle class was very interested in looking wealthy and fashionable. The improvements in the textile industry allowed for fabrics to be experimented with more, and eventually industrial chemistry led to the invention of new dyes. If you think of the Victorian Era as black or white, or sepia toned, blame cameras - bright colors were usually fashionable, and often times in impressive patterns, too (like paisley! ), many of which were made possible by the new technology. For instance, paisley could only be mass-produced because of the new Jacquard looms , the precursor to computer-controlled manufacturing; the same was true of the fancy new tartans associated with the Romantic "revival" of supposedly-ancient Scottish traditions. Also, make-up in those days, and raised hemlines, were considered taboo and inappropriate. The Sisters Bronte: Charlotte Brontë, Emily Brontë, and Anne Brontë. Most notably Emily's Wuthering Heights and Charlotte's Jane Eyre. Anne's The Tenant of Wildfell Hall was also wildly popular at the time. Rudyard Kipling. His The Three-Decker in particular is an exultation in the common Victorian work, the three-volume novel. Steam Punk: As this was the time in which the steam engine became prominent, most Steam Punk works are based in Victorian Britain.